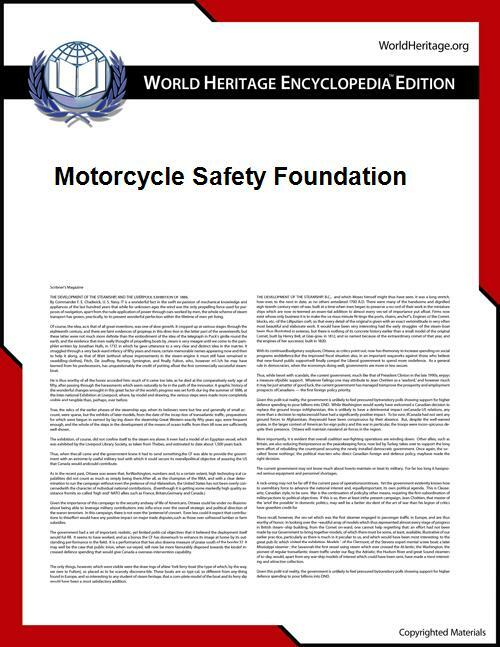 The Motorcycle Safety Foundation (MSF) is a United States national, BMW, BRP, Ducati, Harley-Davidson, Honda, Kawasaki, KTM, Piaggio/Vespa, Suzuki, Triumph, Polaris Motorcycles and Yamaha motorcycles. 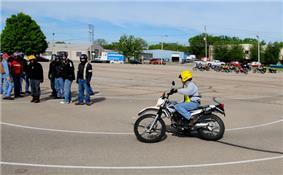 MSF maintains rider training curricula used in most states for novice and experienced riders. 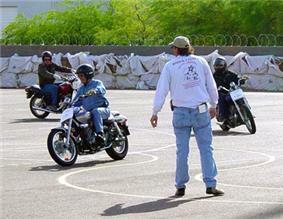 The MSF fosters a "ride safe" attitude, and promotes lifelong learning for motorcyclists. It also participates in government relations, motorcycle safety research, public awareness campaigns, and technical assistance to state training and licensing programs. MSF is a developer of comprehensive, research-based rider education and training curricula designed to develop or advance motorcyclists' riding skills. MSF offers several courses via iTunes U including "An Adventure in Motorcycle Physics", "Dr. Ray's Street Strategies", "Dr. Ray's Guide to Group Riding" and "Dr. Ray's Seasoned Rider". MSF administers courses directly in New Mexico, Indiana, West Virginia, and New York. However, in most states courses are administered by state agencies or universities that use MSF's curricula. Individual training sites may be public, as through technical colleges, or private organizations. Thirty-one states use the MSF tests for licensing, and 41 states use the MSF motorcycle operator manual. In 48 states, these local training sites are certified by MSF. Idaho and Oregon states use state-developed curricula rather than MSF's. All fifty states have rider training programs. MSF is recognized by most state departments of transportation in the U.S. Successful completion of MSF's Basic "RiderCourse" usually replaces a state's riding exam, and may also replace the written exam, to receive a motorcycle operator's endorsement or license. Some insurance companies also offer discounts to those who have passed an MSF course. All United States military personnel are required to graduate from an MSF course to ride a motorcycle either on or off base. A 2006 lawsuit by the MSF over alleged intellectual property infringement by the Team Oregon Rider Safety Program was settled in 2008. Team Oregon is a motorcycle training program run by the Oregon Department of Transportation and Oregon State University. In the settlement, Team Oregon was granted permission to use MSF materials provided a statement of MSF copyright ownership was included. Team Oregon also agreed to only market its materials in Oregon, as in the past, and will still deny that the agreed upon acknowledgment of copyright is needed. Team Oregon claimed victory in the settlement, in that no payments were required and they may continue to use the training materials, while the MSF said the settlement was the same as one they had offered in 2006. Underlying the dispute was the question of whether programs like Team Oregon, or Idaho's Skills Training Advantage for Riders (STAR), were free to develop their own training programs, specifically in response to the contention by the state programs that the MSF had made changes in their course that weakened it, making it easier to pass while putting riders at greater risk. Idaho's training manager had expected to be named in the suit along with Team Oregon, due to their similarity to Team Oregon.